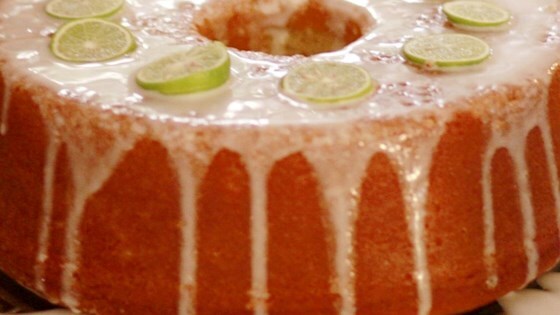 "Key lime juice and rum are baked in the cake, which is then glazed with more lime juice and rum!" Preheat oven to 325 degrees F (165 degrees C). Grease and flour a 10 inch tube pan. Mix together the flour and baking powder. In a large bowl, cream together 1 cup butter, 1/2 cup shortening and 2 cups sugar until light and fluffy. Beat in the eggs one at a time. Beat in the flour mixture alternately with the milk, mixing just until incorporated. Stir in 2 tablespoons rum, key lime zest, 2 teaspoons key lime juice, vanilla extract and lemon juice. Pour batter into prepared pan. Bake in the preheated oven for 90 minutes, or until a toothpick inserted into the center of the cake comes out clean. Allow to cool in pan 10 minutes. Turn it out onto wire rack. While warm, prick top of cake with toothpick. Pour Key Lime Daiquiri Glaze over warm cake. Cool completely. To make Key Lime Daiquiri Glaze: In small saucepan, combine 1/4 cup sugar, 1/4 cup butter and 2 tablespoons key lime juice. Bring to boil. Continue to boil, stirring constantly, for 1 minute. Remove from heat and stir in 3 tablespoons rum. My boyfriend really enjoys key lime pies, so I put this together for him. Great recipe! Reminds me of my grandmother's pound cake, but with a key lime zing. He loved it! My family and friends rave about this cake. Wonderful flavor. Baked at 325f. and the cake tested done in 1 hour and 15 minutes instead of the recommended 90 minutes. A bit n the dry side. It needs more key lime juice. Probably a 1/4 cup should do the trick and maybe using real rum as well or a rum extract and not "flavoring" should kick it up a bit. cake was good. however it needs to be cooked for a little more than an hour and not 90 minutes. i liked the texture. but was looking for more flavor.